In 1971, Atlantic Records released a pair of Dusty Springfield singles produced by the legendary songwriter/producer Jeff Barry (one-time songwriting and romantic partner of Ellie Greenwich, and author of too many hits to name): "Haunted"/"Nothing Is Forever" and "I Believe In You"/"Someone Who Cares." A restless Dusty, freshly relocating to America from her native England, then departed the label and left an additional 9 songs recorded with Barry in the can, where they stayed until Rhino issued one track, "Faithful" (in mono), as a bonus track on the 1990s CD release of Dusty's 1970 Atlantic album A Brand New Me. 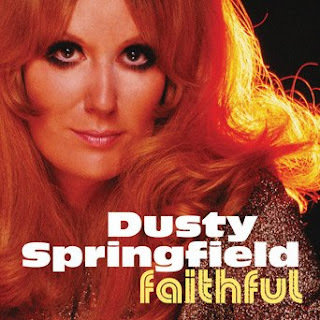 The other tracks didn’t surface until a subsequent deluxe reissue of Dusty’s landmark 1969 album Dusty in Memphis included them as bonus cuts. Now, reissue producer Jim Pierson—who tracked down the missing masters after being lost for over two decades —has assembled Dusty’s Barry-produced masters and put them together in a single package for the first time to create the third Dusty Springfield Atlantic Records album as planned in 1971. Real Gone Music’s release of Faithful on LP presents these historic Barry-Springfield collaborations exactly as they were originally intended to be heard, with the 12 tracks meant for the album release finally out on vinyl 45 years later. All tracks are in stereo, while the liner notes on the inner sleeve, penned by The Second Disc's Joe Marchese, feature a number of rarely-seen photos of the legendary singer. These stunning pop, soul and gospel flavored selections showcase the iconic singer at the height of her vocal magic. A missing/jumbled part of Dusty’s august recorded legacy, finally set right and available in its intended format. Out on orange vinyl limited to 1,000 copies!